It's been 16 years since the two were connected by Tarantino's "True Romance"
They now get along "like a house on fire"
LONDON, England (CNN) -- With Quentin Tarantino's recent disclosure that Brad Pitt "pulled out a brick of hash" for the pair to smoke during a meeting about Tarantino's new film "Inglourious Basterds," the two movie icons could today be mistaken for old roomies. Brad Pitt and Quentin Tarantino have always wanted to work together but couldn't find the right project before "Inglourious Basterds." However, in an interview with CNN, the charismatic director of "Pulp Fiction" and "Reservoir Dogs" insists that the well-anticipated union was a long time in the making. "It was very much a case of us wanting to work together, but waiting for the right project to come along," he told CNN. It has been 16 years since a youthful Pitt featured -- rather fittingly, it seems -- as a stoned layabout in "True Romance," the Tarantino-scripted tale of lovers on the run. Since that time, Tarantino says, "everybody's been wondering when this great love affair is gonna happen." And yet, when Tarantino first approached Brad's representative about another project, the agent was apparently "too protective" of the future relationship between the director and his client. "He told me the last thing he wanted was to put us in the same room and let us fall in love over a movie we wouldn't be able to do." A seasoned filmmaker by this time, Tarantino could relate to the points raised by the agent and decided to take a step back and let things happen naturally. At this stage, however, Tarantino was still not entirely convinced Pitt would be the best choice. "Then, I wrote a little bit more and thought Brad would be terrific. By the time I got towards the end, I felt he would be perfect but became worried I wouldn't get him." He quickly made contact with the agent again and explained there was another project in the pipeline. At this point, he was worried Pitt could already be committed for the next few years. Fortunately for the army of Pitt and Tarantino fans around the world, this was not the case. "His agent said Brad doesn't do that because he wants to be available when good material is offered." 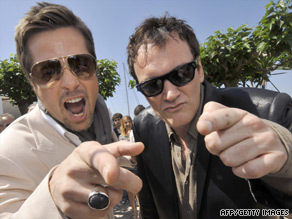 "It was a lot of fun working with Brad, which wasn't very surprising," Tarantino told CNN. "We had already been told we would get along like a house on fire, and that's pretty much what happened." With Tarantino's revelation Tuesday on the Howard Stern Show that he and Brad had got through six bottles of wine and a "slice of hash" in one night, Angelina may be one of the few people hoping that this is not the start a beautiful relationship.